I was surprised at what I dreamt of being at the age of 52. I never expected that what started as accompanying my husband to the early morning walk would become an obsession. A 15 minutes short run everyday, encouraged me to sign up for the Wipro Marathon 2015 . It was then I came to know that several groups across the city met every morning trained together and ran with all their heart . Luck favoured me through a friend who introduced me to DR Marina group . 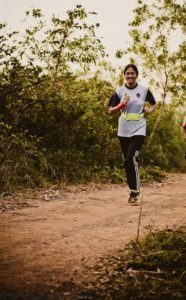 I started looking forward to the Tuesday and Saturday session where our coach Bharath teaches us simple exercise and effective techniques, then I signed up for almost all the runs that I came across. Running not only keeps me physically fit but also helps in my mental fitness. It is not just the calories that burn when I run but also all the stress and hard feelings . So don’t ask me why I run, ask yourself why you don’t.